The philosopher k found Zarathustra the Baby Bat in an ancient redwood grove formerly believed to hold the tallest tree in the world. Peering into a cave that had been burned out of the trunk of a living redwood tree, k saw, lying feebly in the dust, a baby bat. k assumed that the young creature's death was imminent, and coveted its body for an art project. k scooped it up and tucked it, with its tiny beating heart, into his breast pocket. When its pulse disappeared he planned to skin it and place the carcass outside where maggots would clean the precious bones. In the ensuing day and night, little Zarathustra did not die, but neither did it accept milk. k got frustrated and, explaining that he was hastening the inevitable, smothered the baby under a pillow. Then he enclosed its still form in a shoebox. I had removed myself from the room for the awful event. Now I returned and asked to inspect the corpse. k, clearly shaken by his deed, pointed to the shoebox. I lifted the lid and looked inside. Zarathustra had resumed breathing. I daresay, if a bat could have rosy cheeks, this one did. "It looks like you have a pet," I said to k.
I provided k with a proper eyedropper by which he could feed his charge and a small vial of whole milk. k grimly, nay tenderly took his new friend in hand and brought the eyedropper to its mouth. Now Zarathustra opened its lips and drank eagerly. For the next week, k carried Zarathustra everywhere in his breast pocket. Just after 5 p.m. each evening, the little bat crawled out and chirped for milk. k, who made sure to have the milk vial and eyedropper handy, fed Zarathustra, whereupon the bat climbed back in the pocket. 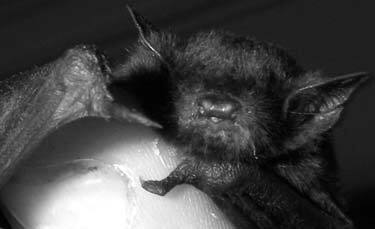 A baby bat's stomach is very small, though, and an eyedropper is comparatively large. One day k carelessly pushed most of a dropper-full down his pet's gullet, and little Zarathustra died with milk on its lips.